After class today I started sweating and shaking and knew what it was from. I headed straight to the card store because it was withdrawal. We have all had symptoms at one time or another and we all know the cure is to rip some packs. I had e-mailed Dave of the Baseball Card Store to see if they had any 2010 Upper Deck Series 1 in, and their shipment was delayed for legal reasons apparently, and would not ship out until today. Schucks, I will have to go back tomorrow or Monday, how will I ever deal with that? They had a hobby box of 2010 UD Signature Stars still sealed so I popped it open and starting opening packs. Odds were good, 1:4 packs would get a hit, but my luck I figured I'd have to open 10. I picked the bottom pack, top right, and got air. I picked the bottom pack, top right, and got air. Bottom right pack, you see where this is going.... Finally bottom left, I got a hit if you want to call it that. Dave then decided to open a pack, and he gave me the cards out of pity for my pathetic display of luck I think. I didn't get a single Yankee, Pujols, or Lind. I don't care about Lind or Pujols because I had already bought them on eBay figuring I wouldn't be opening any packs. I scanned all the cards, wrapper including for the purpose of showing that the wrapper states TWICE that they are not licensed, and so do the back of the cards which you will see on two that I scanned the backs of. 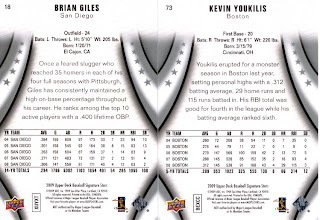 I scanned the back of one guy because I hate him, and the other guy was just who was left so poor Giles. 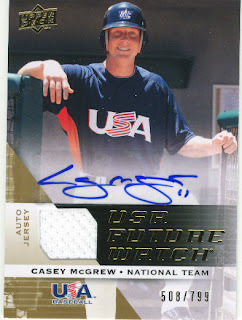 I also kept one wrapper from this fiasco in case Tribe Cards wants it. 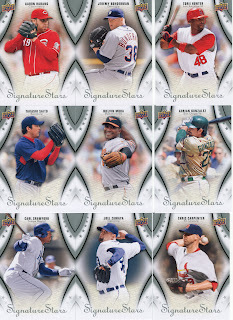 Despite the logos of the teams missing, the cards are like any other card they put out in years past. The one thing I don't like about this particular set is that they used a color Upper Deck logo in the upper right that reminds me of a cheap set like First Edition. This is supposed to be a higher end product so I think the logo should have blended in more, but what do I know I don't make cards. There you have it, 1:5 packs there is an autograph. They never guaranteed it would be good, nor a guy that you have heard of. 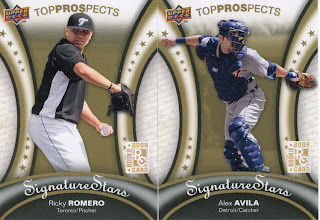 I am holding out for Upper Deck Series 1 for now. I went to Target today also to see if they had anything and zippo so far. I will be vigilant in checking for our loyal readers because I want you all to know when they hit the shelves.... yeah that's why. I'll keep telling myself that. Oof. I also saw blasters of Sig Stars at Wally World. I decided that a few packs to test the waters would be better (we'll see, I haven't opened them yet.. Been busy). Damn Walmart near my house doesn't carry trading cards, and the next closest Walmart is like 40 minutes away. I'll just make my daily trips to Target... grumble. 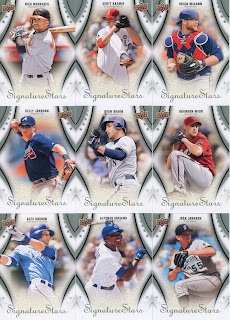 I was extremely disappointed with signatures stars. I sent them a nice little letter. Hope to hear from them soon. As for Walmart you might want to recheck it my Walmart didn't carry Baseball cards for about 1 year all of sudden I went in the other day and they had 2010 Upper Deck. Bummer! No Tribe cards either. Did you save me a hobby wrapper ??? 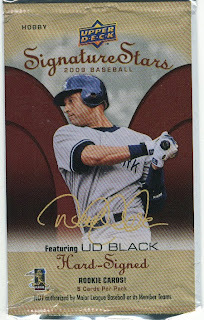 I did run across a stack of Yankee Stadium Legacy cards.I'll check your list ! 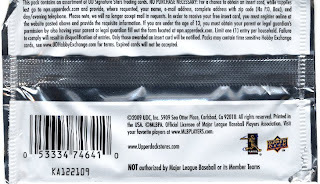 The disclaimers on the wrappers and cards sure seem like weak sauce to inoculate UD against legal action. You would have thought that MLB Properties would have given UD a list of demands of what would constitute inappropriate use of logos and trademarks, including partial or oblique views on jerseys and caps. What's different is that this time the battle is along the usual Topps-UD , but with the property holder and UD; a lot more legal power is going to be held with the MLB. Better snap up what you can of 2010 UD; I wouldn't be surprised if a cease and desist came pretty quickly, preventing further printing and sale, if a recall is unlikely. You would have thought MLB would have seen this coming miles away. You aren't missing much with UD Series 1. Kind of blah, personally.